The topography in the southern iMfolozi section ranges from the lowlands of the Black and White iMfolozi River beds, to steep hilly country which includes some wide and deep valleys. Habitats in the iMfolozi Section are primarily grasslands, which extend into Acacia Savannah and woodlands. 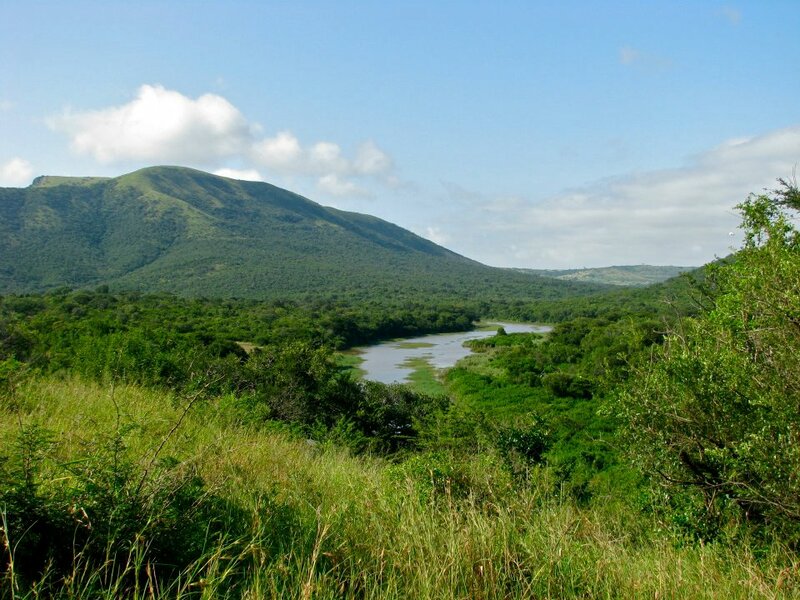 The northern section of the park (known as the Hluhluwe section) has hilly topography where altitudes range from 80 to 540 meters above sea level. The high ridges support coastal scarp forests, with valley bush-veld at lower levels. 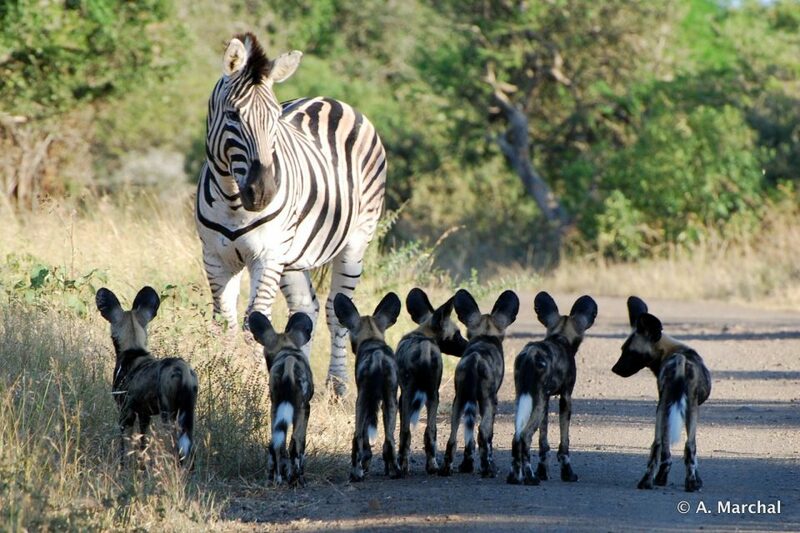 Wildlife ACT’s main focus in the Hluhluwe Section of HiP includes the monitoring of the African Wild Dogs, Lion, Elephant and Rhino populations. During these monitoring sessions, any incidental sightings of other priority species including Cheetah, Vultures and Leopard, will also be recorded. Wildlife ACT’s main focus in the iMfolozi Section of HiP includes the monitoring of the African Wild Dogs, as well as Lion, Elephant and Cheetah. During these monitoring sessions, any incidental sightings of other priority species including Rhino, Vultures and Leopard, will also be recorded. NOTE: A significant and very valuable component of all wildlife monitoring is the use of camera traps, since they provide extra “eyes” for us in the field, especially at night. On all our projects, the regular checking and rotation of camera sites, and downloading & sorting of camera trap images, forms an integral part of the monitoring work. 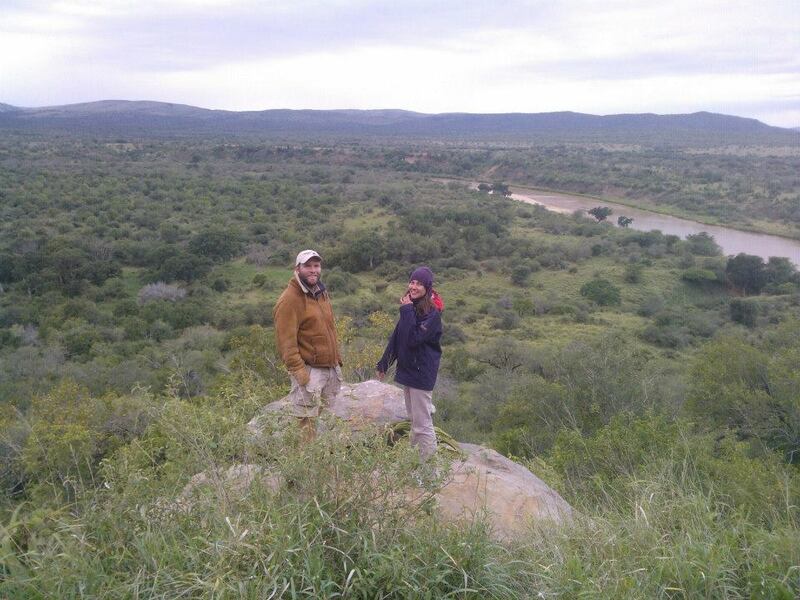 Our volunteers are based on top of a hill in the iMfolozi section, near a Section Ranger’s outpost, in an eco-camp. The camp offers twin rooms, separate toilet and shower facilities, a rustic kitchen, decked sitting area and a barbecue area. There is a spectacular view of the Black iMfolozi River from a lookout post below the camp – affectionately called “the Rock”. *Just a note: the accommodation at the iMfolozi camp is basic, isolated and reliant on a generator and solar power for electricity. At times the power supply can be somewhat unreliable, so please ensure that you have enough spare batteries to rely on in case you cannot recharge there as often as you would like. View the gallery here. Hluhluwe volunteers are based at the Hluhluwe research camp, affectionately known as ‘Dung Beetle’, which is located on top of a hill in a coastal scarp forest. Dung Beetle camp is shared with other scientists and researchers carrying out studies in the park, although their rooms are separate from our Wildlife ACT participants. Our Wildlife ACT volunteers are accommodated in twin rooms, and have communal toilet and shower facilities. There is also a communal kitchen and barbecue area. The camp is situated within walking distance from the main tourist camp – “Hilltop Camp”, which is open to the general public and has a restaurant, small shop and swimming pool. View the gallery here. 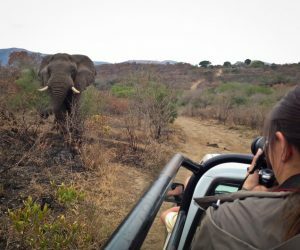 Hluhluwe-iMfolozi Park is home to a rich diversity of wildlife, including the “Big 5” (Black and White Rhinoceros, Elephant, Buffalo, Lion and Leopard), as well as species such as African Wild Dog, Cheetah, Hyena, Jackal, Blue Wildebeest, Giraffe, Zebra, Nile Crocodile, Hippopotamus, Bushpig, Warthog, Mongoose, Chacma Baboons, Vervet Monkeys, as well as various antelope species including Waterbuck, Kudu, Nyala, Impala, Reedbuck, Bushbuck, Duiker, Steenbok and Suni, and a variety of Tortoises, Terrapins, Snakes and Lizards. The park is also a prime birding destination, with over 320 recorded bird species. The wildlife at HiP has an interesting and varied history. RHINO: In 1895 there were only 100 white rhino left in the world. In 1960, once the reserve had been established and the tsetse fly controlled, the population grew from 100 to 2300 individuals. Operation White Rhino or “Save the Rhino Campaign” helped reintroduce over 4500 white rhino across Southern Africa. The rhino in HiP is now rated as the 6th global key population by IUCN African Rhino Specialist group. ELEPHANT: Elephant had become locally extinct during the mass slaughtering period and were later reintroduced from 1981 following a period of 80 years of absence. During 1985 – 1991, 160 elephant were introduced from Kruger National Park. There were a few mistakes made during this process as only younger bulls were moved, which meant that no established leadership was formed. The effects were that these youngsters became confused and charged all around the park sticking together. Eventually the population settled down, however when these youngsters came into must they started to kill rhino! At the time management decided to bring in 10 mature Tuskers from Kruger to counteract this problem. These mature bulls initiated discipline into the youngsters and the rhino attacks were reduced. Rhino still get killed by elephants today, however this is probably due to the high percentage of rhino in the park. The elephant population is at around 700 elephants today and the park management is working at reducing the birth rate through contraception in order to prevent the population from reaching unsustainable levels in the reserve. LION: In the early 1990s there was a small founder population of lion that were showing signs of inbreeding. The effects of this were seen in high cub mortality and very low genetic variation among individuals. The population recovered after a number of reintroductions, however many lion still suffer from Tuberculosis today. The park holds about 120 lions that can be accounted for today. Management of these lions is still intensive and requires constant planning in order to improve genetics and control the number of lion at a healthy level. PREDATOR RE-INTRODUCTIONS: African Wild Dogs were reintroduced in 1980 and again in 2002. Cheetahs were reintroduced in 1966. The population of Wild Dog in HiP currently stands at approximately 87, however a number of dogs have dispersed and are roaming outside the park so these numbers are not fixed. The cheetah population seems to have taken a dive over the last couple of years (since 2016). 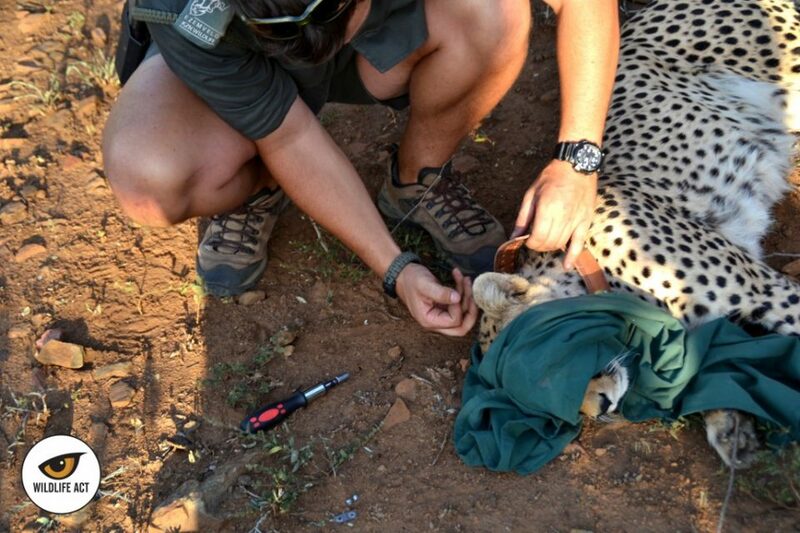 Ongoing work is progressing to work out the number of cheetah and possibly reintroduce new genes. Species Previously Abundant: Blue Duiker, Common Reedbuck, Mountain Reedbuck, Waterbuck, Bushbuck, Brown Hyena and Black-backed Jackal. HiP also contains almost half of the bird species in the entire Southern hemisphere – of which 16% are recognized as Red Data Species. 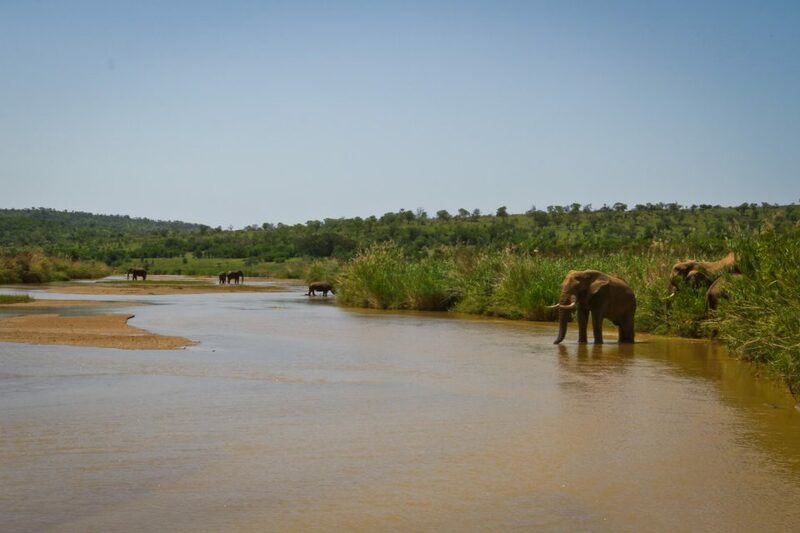 What makes Hluhluwe-iMfolozi Park so Special? iMfolozi was the home of the now famous “Operation Rhino” in the 1950’s and 60’s, which resulted in the saving of the Southern White Rhino (Ceratotherium simum) from extinction. iMfolozi is also famous for its ‘Wilderness Trails’ which originated in iMfolozi in the 1950’s, and the Park’s renowned Game Capture unit. We are proud to be assisting “Ezemvelo KZN Wildlife” – the national park authority, in protecting the endangered and threatened species on Hluhluwe-iMfolozi Park. 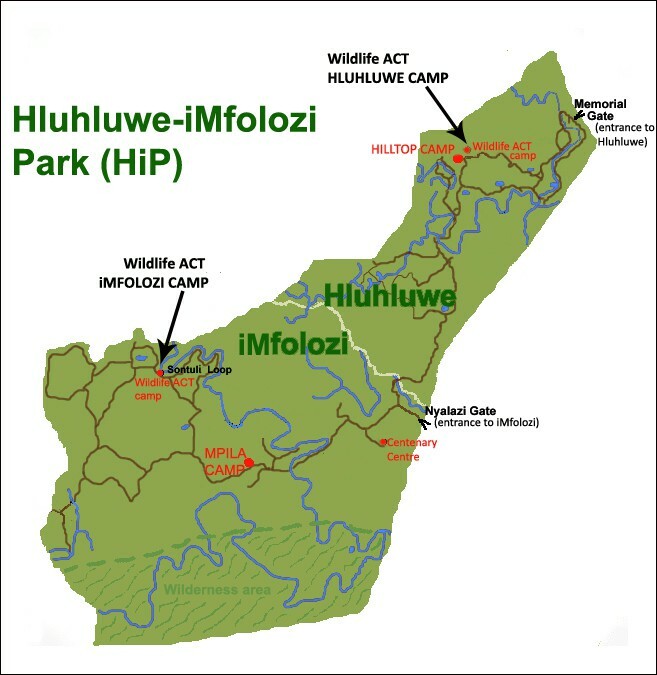 Hluhluwe-iMfolozi Park is the oldest proclaimed protected area on the African continent. It is steeped in history and forms an island of natural habitat surrounded by densely populated communities and agricultural lands. The reserve not only protects our natural places and wildlife, but also plays a critical role in the creation of jobs among an impoverished society which surrounds the reserve. HiP is a rich and very important archaeological site. Evidence suggests that people lived in and around the park as early as the Stone Age to late Iron Age. The Khoisan exploited most of the area during the Stone Age and later evidence suggests that between 200-300 AD people with more advanced technology started entering into Zululand. These people are suggested to be the ancestors of the Nguni speaking communities. Many stone tools can be found within HiP as well as evidence to suggest the advancement of smelting sites and the use of kraals and burial sites. Iron Age farmers practised a method of farming known as “swiddering” which is essentially the same as slash-and-burn where areas were left fallow after use. It is suggested that this may have had a profound effect on the vegetation as today much of the woodlands and savanna are no longer considered “pristine plant communities”. Shaka Zulu had also established his royal hunting grounds in iMfolozi during his reign between 1818 and 1828. Evidence of his hunting pits still exist today and can be seen on trail walks. During the early 1800’s the arrival of “great white hunters” led to the mass slaughtering and destruction of wildlife in this area through hunting. Hundreds and thousands of animals were shot, and in less than fifty years the all the elephant herds were slaughtered. The elephant and white rhino populations at this point were on the verge of extinction with just 100 white rhino left in the entire world in 1890. When a white hunter shot 6 white rhino in 1894 there was an outcry that led to the proclamation by the Zululand Colonial government of 5 reserved areas or described as a “game sanctuary”, these included Hluhluwe, iMfolozi, Corridor and St Lucia. 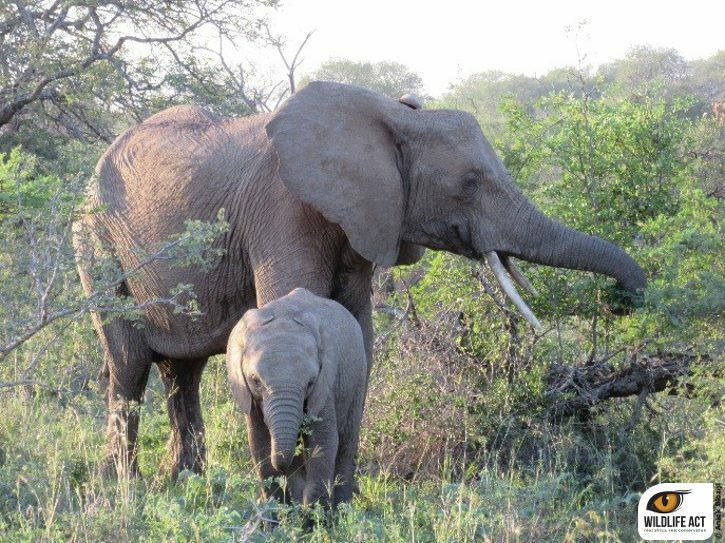 However it was only in April of 1897 that Hluhluwe and iMfolozi was established as a reserve. The corridor section was only incorporated in 1989. The linking of both reserves allowed for a fully functional ecosystem to take its course, and is now home to over 1200 plant species, 84 mammals and 350-400 bird species. iMfolozi contains the first area across the African continent to be established as a “wilderness area” where a state of naturalness must prevail and a “no trace policy” adhered to. There are three main water systems in HiP. These include the Black iMfolozi River, the White iMfolozi River and the Hluhluwe River. 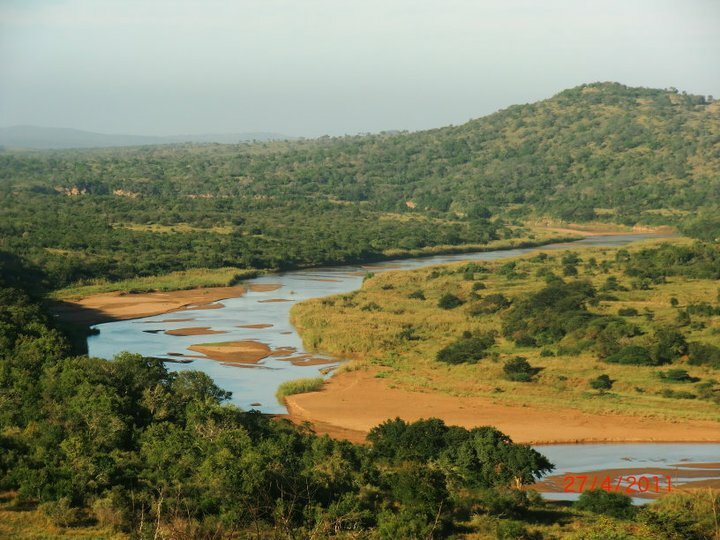 The Hluhluwe River feeds into three tributaries known as Mansiya, Manzibomvu and Nzimane. The White iMfolozi River source is near Vryheid while the Black iMfolozi River finds its origins just east of Vryheid. The confluence for these two rivers is at Siyambeni in the wilderness section. Hluhluwe River has its origins in the catchment of the surrounding hills of Hlabisa. HiP climate over a long-term period is usually determined by a 18 year cycle of wet/dry years with 9 wet years followed by 9 dry years. The North Easterly and Easterly winds bring moisture in the summer whereas the westerly winds bring drier conditions in the winter. These dry winds in autumn usually cause the flammability of the vegetation in these years to increase thus increasing the chance of veld fires. HiP falls within the savanna biome in the southern extremity of the Maputaland – Pondoland biodiversity hotspot. There are suggested to be around 1200 plant species. Of these 300 tree species have been described and 150 grass species. Plants that are protected in this area include Natal Giant Cycad, Stangeria and the Pepper Bark tree. A tilt of the African continent 120 million years ago and again 1 million years ago led to the gently rolling landscape to become more elevated as seen in Hluhluwe. The general geological structure of HiP is a result of fracturing and faulting. The oldest formation which forms the basement granite is estimated to around 450 million years old. Overlying this is the Dwyka formation that caused all the glacial striations visible on the rocks today. This can be seen in the Nzimane River in Hluhluwe showing a southwest movement of ice at that time. The Ecca groups which include Pietermaritzburg, Vryheid and Vollsrust overly the dwyka. The Ecca groups are the most dominant surface geology in the park. The Vryheid formation forms the most common rock in HiP being shales, sandstones and siltstones. The rivers of HiP are made up of fine to coarse sediments from the Nyoks formation. The rich black soils seen in the park are a result of the Sabi River basalt formation and can be seen in the Manzibomvu River. What Makes HiP so Special and Unique? HiP – the oldest reserve in Southern Africa – has a wealth of history and cultural heritage. The years of hardship that both the people and wildlife faced have forever impacted this area. The wildlife has been through enormous stress but has still managed to bounce back and continue the struggle of survival.